After my first visit to Zion National Park in 2000, I left knowing I had visited the most beautiful spot on Earth. I've been back two more times, including most recently this past September, and I still feel the same way. There is something very special about this place and you have to be there to truly feel it. And of course pictures do not do the place justice. What makes Zion so special to me are two things: 1. You're IN the canyon. As opposed to Bryce or the Grand Canyon where you're on top, here in Zion you are the bottom of the canyon. It's awe inspiring being able to look up in Zion and see those towering mammoths of granite high above you. 2. The Virgin River and the oasis in the desert it provides. Zion is located in a desert environment, and the temperatures can be sweltering there in the summer. But thanks to the Virgin River you can take a swim and sit under the trees that surround the river. You can easily see why settlers were attracted to this area. The free shuttle bus is in itself the first attraction at Zion. For most months of the year, automobiles are barred from entering the main drive in to the park. The shuttle ride gives you an amazing tour of the canyon with views out either window. Of course you have to get off the bus and take a walk (especially when the buses become overcrowded and you must escape from either overly talkative tourists and/or the overpowering scent of BO). 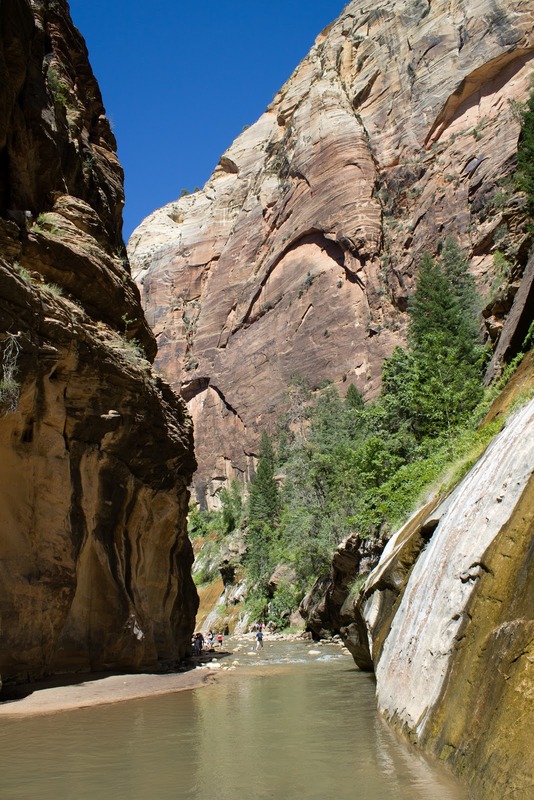 Some key hikes are: Weeping Rocks and the Riverside Walk offer two of the easier hikes in the park. Weeping Rocks takes you up to a rock alcove with a hanging garden and dripping water. The Riverside Walk, found at the very last stop in the park, is a paved trail that takes you to the mouth of the Narrows. The Narrows hike itself can be quite strenuous as you hike across swift moving water and step on slick, uneven rocks. The Lower and Middle Pools hike gets you off the valley floor allowing you to walk to a series of waterfalls. And finally, for a strenuous hike with an incredible view, the Angels Landing hike is a MUST. Just be warned - you will climb almost 1500 feet and walk on trails that have steep drop offs. But the view is well worth the effort. And there's nothing like ice cream and relaxing on the cool grass at the park's lodge. This is a must reward after a long day of hiking. Nearby Springdale is the closest town to Zion and offers a handful or so restaurants, outdoor shops for Narrows hiking supplies, a bike shop and several stores to buy (overpriced) gifts. 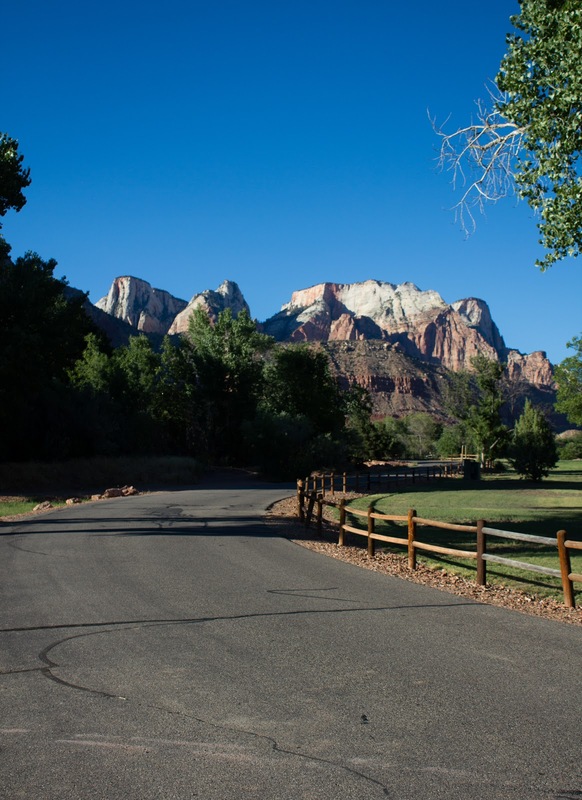 The Best Western Zion Park Inn is a nice, moderately priced option for lodging. The back patio offers a nice, commanding view of a nearby granite cliff and witnessing a sunset here is simply the best way to conclude a day at Zion.